Erica Behmke, of Neosho, was chosen by Rock River Salon & Tanning of Hustisford as their makeover for the month of July. 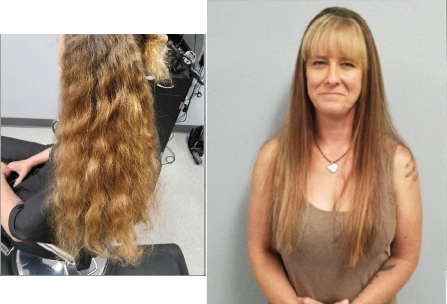 Shyla Smart, stylist at Rock River Salon and Tan­ning, added highlights and lowlights to Erica’s hair to give her some dimension. Brighter blondes and a fun rich red mixed with cherry color from Scruples color line were used. Paul Mitchell Super Skinny Serum was applied to her hair to help give it a smooth look. Shyla then blew her hair dry and used a flat iron to give her a sleek look. Erica looks great for summer!